So another step in the right direction for Windows Defender, it can now run in sandboxed mode. For now you have to turn it on but in the future that will be default. So lets assume you also run ConfigMgr, now this is where its gets intreseting. We can then use a CI to track if it has been turned on! This is done using a very simple detection script. Here is the small code snippet used to track compliance. Now two things remain, set the data type to boolean and as compliance set to “True”. All set to measure this. Of course a simple script or package can now be used to force the setting of this, just remeber that its only supported on Windows 10 1703 and later and will require a reboot before taking effect. When you upgrade to Windows 10 or between diffrent Windows 10 versions there are genearlly several things you wish to do. This can include removing “bad” applications or install drivers. Among some common things that needs to be taken care of is diffrent pre-requisites and language packs. 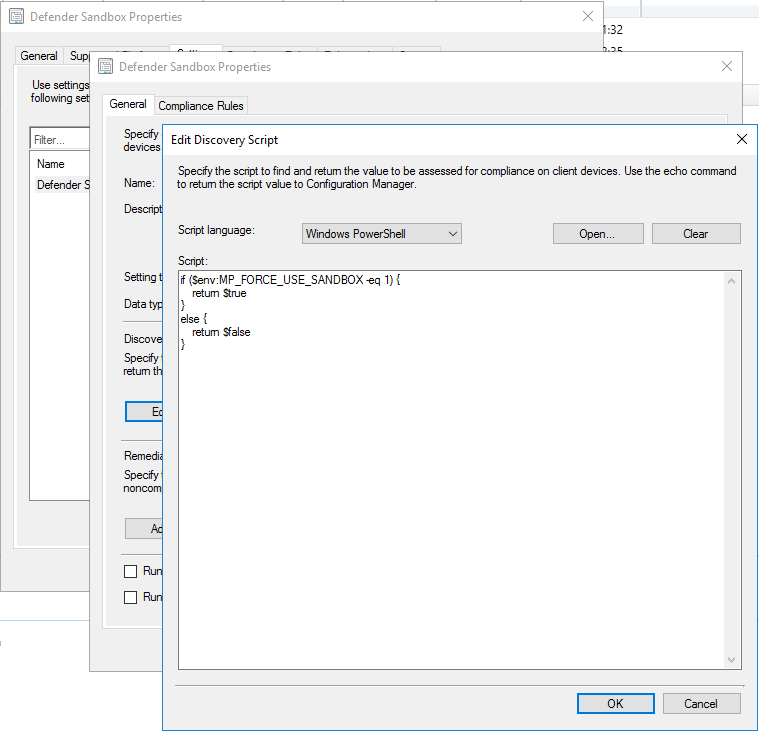 This posts covers some things you can improve in your Windows 10 upgrade sequence. The small things first. As more and more users are working from a laptop a common problem is that someone intiates the sequence when the users has 10% battery left. Now the predicatable outcome is broken upgrade and rollback. To prevent this we can enable a small check to verify if the machine is running on battery power and if so exit the sequence quickly all while we leave a log trace for admins to track. Create a package with source files but no program. 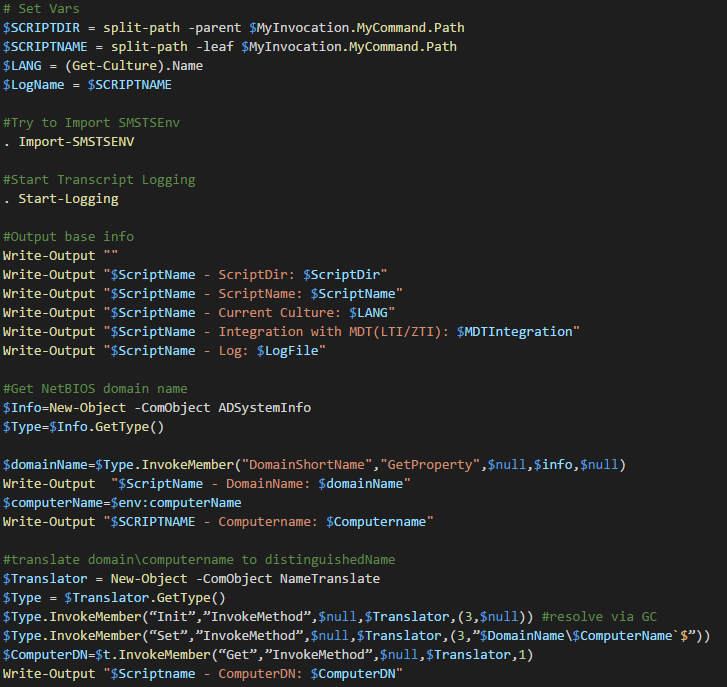 Then add a Run PowerShell Step in the begning of your sequence. Use the new package that has been created and set the script name to Get-xTSRunningOnBattery.ps1. Set the execution policy to ByPass. That will take care of machines running on battery. Next common issue is that machines not connected to the wired network won’t reconnect to the network after a restart. To assist with this we can make sure that the upgrade does not run if its not a wired connection. 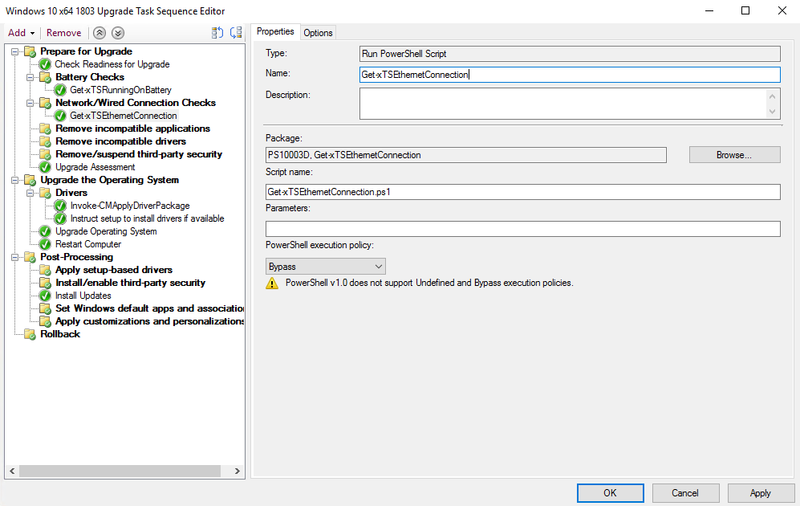 Create a package with source files and no program then add another Run PowerShell Step in the beginning of your sequence. Use the new package that has been created and set the script name to Get-xTSEthernetConnection.ps1. Set the execution policy to ByPass. Now we create another package with source files but without any program and add a final Run PowerShell Step to our upgrade sequence. This time at the very end of the sequence. 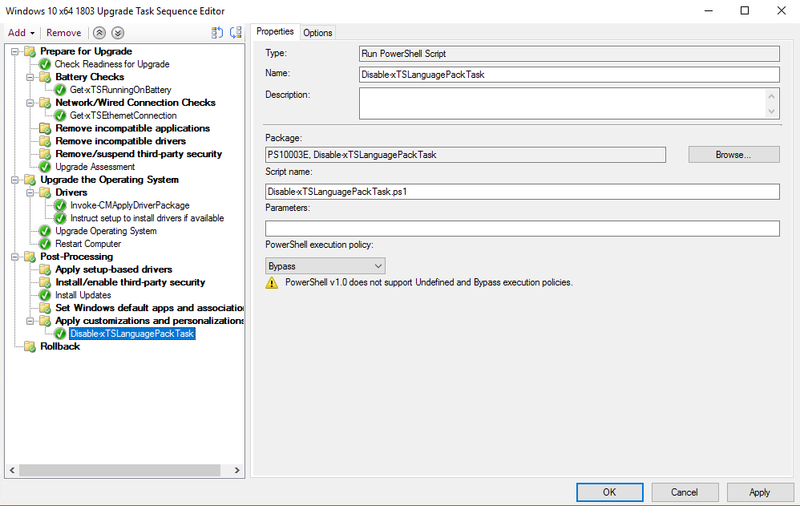 Make sure to use your new package, set the script name to Disable-xTSLanguagePackTask.ps1 and set the execution policy to ByPass. Now you should be all set to upgrace your machines. Now my issue with this is there is no log file created and no way for helpdesk to verify it actually happend (besides logging on which I don’t like). 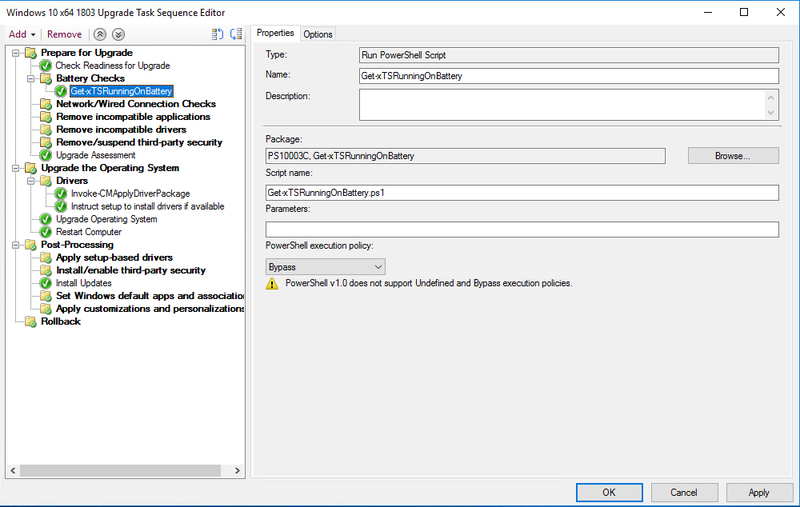 So to solve this I have made an updated version of the script that centralizes logging basone if the script is run as part of MDT, Configuration Manager or Standalone. When upgrading MBAM there are a couple things to note. Number one, if you haven’t already you should make sure you have PowerShell scripts to setup everything on the server side. This will be a nice to have since every servicerelease requires a uninstall/reinstall. And with lots of serviceaccounts, groups and what not, not automating the install will cause you headaches everytime. The next issue is that the agents needs to be ugpraded everywhere. Now there is no panic to upgrade the agents on the machines as the old version will keep reporting to a newer server release. However to benefit from all the bugs and security fixes the update should absolutley be deployed. Now the issue, when you run the MSP on an already patches systems (let’s assume you already have a service release installed) nothing happends. Well this is due to the fact that the MSP only upgrades from version 1.0.0.0 as can be viewed in the MSP itself. Below is from the x64 patch of the september release. Now to fix this the easiest way is actually to create a wrapper around the MBAM agent installer and use that to install the agent. That way if there is already and agent installed we can uninstall it and reinstall the patched version. And if there is no version installed we can go ahead and install the version. All of this can be done using PowerShell and checking the registry for known keys. Now in the source folder you place the MbamClientSetup.exe and the patch file from the latest servicingrelease. The script is prepped for the current September 2017 release. Next up is you run the script as a administrator on a box, or run the script as part of a package in Configuration Manager, an application in MDT or basically however you want. The logfiles will switch location based on if its run as part of Configuration Manager, MDT or standalone. The end result will always be the same! The hardware inventor feature of ConfigMgr helps us discover and track several items. One recurring item is SQL Server and by default there is no nice way of tracking this. Basically the only option out of the box is using the application inventory to find where SQL server is installed. However this usualy results in a large list with mixed servers and clients and you still have no idea if its running SQLExpress, Standard or Enterprise edtion. So what can we do to fix this besides buy a third party solution. Well the good thing is that SQL stores all the information into WMI, this means we can track editions, installations and versions with a bit of trickery with the hardware inventory engine. There are number of steps included here at it is important to follow all of them for a successful result. The first part of this is updateing configuration.mof. This file will control classes that inventoried and then index into the database. In here is the configuration.mof file, now first make a backup copy of the file in case you want to revert the changes later and don’t want edit the file again. At the very end of the file there is a section for adding custom extensions. Done! On to step two. The next step is done in the console and you need some nice permissions to do this. You will need to edit the default client settings object. First thing is first. So we need to create a custom mof file to import. To do this, copy the following and save it as SQLProperties.mof (pick a nice location, like the desktop). Next, head on over to the Administration workspace in the ConfigMgr console and find the Client Settings in the menu to the left. Open up the Default Client Settings and check the Hardware Inventory tab. There is a nice little button named Set Classes, hit that and then hit import. Browse to the SQLProperties.mof file and hit Open. If you are like me and don’t want this inventory to hit each and every device you have deselect the following classes in your default settings. If you are only using the default client settings object, please skip to the next step. 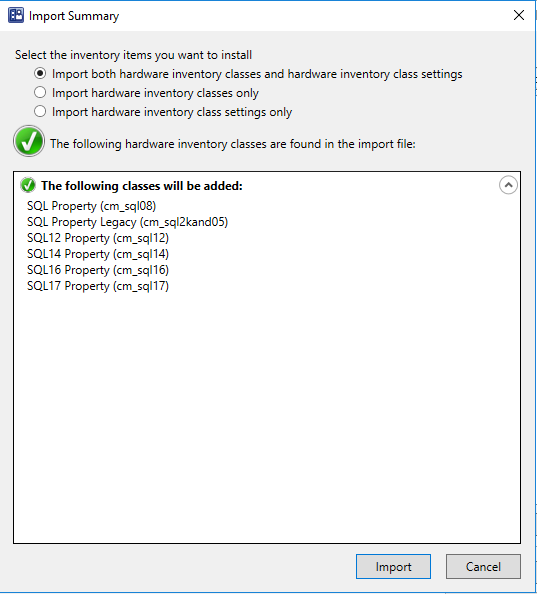 If you are using custom client settings, please add the above classes to be included in hardware inventory under the same tabe as we did the import. This means SQL information will now be imorted into the database! We can now create collections based on this, please do leave enough time for hardware inventory to run on each client before you find data in the database. For me the last piece of the pussel is to create a custom report to easily show me the information needed. I will not cover the details of how to create a custom reports as the options are plenty. However I will share the query used to get a nice detailed view with the server and edition info. Note that this is a simple report and can be extended in a lot of ways and if you are already using PowerBI you can extract the same data that way. Me and Jörgen Nilsson (@ccmexec) did a pre-conf together at Techdays in sweden. And after much slacking here are now the slide deck from that pre-conf. Here is the link to download the slidedeck!